We have seen bhagavAn (SrIman nArAyaNan)’s svarUpa (basic characteristics), rUpa guNa (qualities of physical form), ornaments, weapons and consorts so far. Now we shall see about his followers in SrIvaikuNtam (his abode) and leelA vibhUthi (our world) in this part. svachchandhAnuvarthi svarUpasthithi pravruththi bhEdha aSEsha SEshathaikarathirUpa nithya niravadhya nirathiSaya gnAnakriyaiSvaryAdhyanantha kalyANa guNagaNa SEsha SEshASana garuda pramukha nAnAvidhAnantha parijana parichArikA paricharitha charaNayugala! paramayOgi vAngmanasA parichchEdhya svarUpa svabhAva svAbhimatha vividha vichithrAnantha bhOgya bhOgOpakaraNa bhOgasthAna samrudhdha ananthAScharya anantha mahAvibhava anantha parimANa nithya niravadhya nirathiSaya vaikuNtanAtha! swasankalpa anuvidhAyi svarUpasthithi pravruththi svaSeshathaika svabhAva prakruthi purusha kAlAthmaka vividha vichithrAnantha bhOgya bhOkthruvarga bhOgOpakaraNa bhOgasthAnarUpa nikhila jagadhudhaya vibhava laya leela! svachchandhAnuvarthi – SrI rAmAnuja now talks about the people in SrI vaikuNtam whose reason for existence there is to carry out kainkaryam (service) to bhagavAn and pirAtti. The nithyasUris (those who reside permanently in SrIvaikuNtam and have never been born like us in our world, the leelA vibhUthi) carry out kainkaryam just by looking at bhagavAn’s face, knowing what he desires, unlike bhadhdhAthmAs like us who need to be told by him as to what he wants us to do. svarUpa sthithi pravruththi bhEdha – bhagavAn decides on the persons through whom he wants the kainkaryam to be carried on. These persons’ svarUpa, sthithi and pravrithi are spoken of here. svarUpa is a person’s nature or basic character, sthithi is his sustenance (that which sustains him) and pravruthi is his activity. bhEdha refers to differentiating among these. For nithyasUris, their svarUpam is to carry out kainkaryam (service) the way bhagavAn wants them to. Their sthithi is to live only if they do the kainkaryam (carrying our kainkaryam is what sustains them) and pravruthi is engaging actively in that kainkaryam. They carryout these kainkaryams just by looking at the facial expressions of bhagavAn, out of gratitude for his love and because that is the dharmam (right thing to do) in that place. They do not need to be told to do these things, unlike us. aSEsha SEshathaikarathirUpa – being the embodiment of carrying out all the kainkaryams without leaving anything, with deep affection and love. When bhagavAn wants a service to be carried out, the nithyasUris get fully involved with total dedication in that kainkaryam, making them appear that they are the epitome of the dedication with which the kainkaryam is to be done. Next SrI rAmAnuja lists out the people who carry out the kainkaryams and their qualities. nithya – unlike mukthAthmAs (who have gone from samSaram or materialistic world to SrIvaikuNtam), the nithyasUris have always been granted qualities like gyAnam permanently by bhagavAn. niravadhya – without fault. The kainkaryam is done for the pleasure of bhagavAn and not for the pleasure of nithyasUri. nirathiSaya gyAna – The knowledge of the servitor (nithyasUri in this case) that he is carrying out this kainkaryam; that he is a follower and bhagavAn is the leader; that he is the property and bhagavAn is the owner; this knowledge is fully blossomed out and expansive in the servitor. kriyA – showing in action that he is indeed the servitor, serving bhagavAn. The first step in this is the knowledge that the person is a servitor. The second is the prayer to bhagavAn for kainkaryam, The third is carrying out (kriyA) the kainkaryam. Only in the third stage it gets fulfilled. aiSvarya – direct other nithyasUris and the mukthAthmAs towards kainkaryam. While all the mukthAthmAs in SrIvaikuNtam know clearly what is to be done, they would still expect to be ordered to do this or that kainkaryam. Only then their svarUpam gets vindicated, they feel. Adhi – many other qualities not mentioned above are indicated by this word. anantha – there is no count to the kainkaryams that they can do. SEsha – thiuvananthAzhwAn. The serpent bed of bhagavAn. SEshASana – vishvakSEnar. The commander-in-chief of bhagavAn‘s army. garuda – Bird. bhagavAn‘s vehicle. nAnAvidha – different types of nithyasUris, based on their main work. Included in this term are persons who are guardians of SrIvaikuNtam, both for the outer periphery and inner periphery, guardians of army and so on. anantha parijana – there are innumerable servitors in SrI vaikuNtam like SEsha, SEshASana, garuda, just like there are innumerable qualities. parichArikA paricharitha charaNayugala – Possessor of the two resplendent feet (charaNayugala) unto which such nithyasUris, along with their consorts, carry out unending service. Next SrI rAmAnuja describes SrI vaikuNtam, the abode of bhagavAn. vAngmanasa – to their speech and mind. aparichEdhya – can not be reached. svarUpa svabhAva – great sages may say that SrIvaikuNtam is composed of five upanishaths, (divine/pure/spiritual matter) or is full of sudhdhasathvam (pure goodness). But they can not clearly define its svarUpam (basic character) or its svabhAvam (nature). It is permanent but will change based on the sankalpam (will) of bhagavAn. It is made of 5 upanishaths and can not be considered as being made of a unique material. Because it is not made of unique material it can be taken as permanent. bhOgya bhOgOpakaraNa bhOgasthAna samdrudhdha – bhOgyam refers to the things which are enjoyed (such as divine songs or divine food or divine fragrance from flowers). bhOgOpakaraNam refers to the article or equipment through which something is enjoyed (for example faultless voice or ladle or garland in the examples quoted above). bhOgasthAnam refers to the place where the item is enjoyed. It could be a a maNdapam (court-hall) or dining hall or garden. SrIvaikuNtam is full of such things. anantha AScharya – having countless such wonderful things. They will appear new, but would be there for a long time. anantha parimANa – of such dimensions that one can not imagine or visualise. nithya niravadhya nirathiSaya vaikuNtanAtha – bhagavAn, who is the lord of such a place (SrIvaikuNtam) which is permanent, faultless and wondrous. SrI rAmAnuja next goes on to describe bhagavAn‘s wealth in leelA vibhUthi (samsAram or materialistic world) and then surrenders unto bhagavAn who is the sole owner of both vibhUthis (SrI vaikuNtam and leelA vibhUthi). svasankalpa – the leelA vibhUthi acts as per his sankalpa (will). Contrast this with SrIvaikuNtam for which SrI rAmAnuja used the term svachchandhAnuvarthi (acting as per his thoughts), and we know how vastly different the two realms, nithya and leelA vibhUthi and the people within these two realms are. In other words, we in leelA vibhUthi will act only as per his order and not as per his desire. His nithya vibhUthi exists for his happiness and leelA vibhUthi for his play or pastime. This is why he keeps creating and destroying leelA vibhUthi (protecting too, in between) while nithya vibhUthi always exists, as its name nithya (permanent) refers to. anuvidhAyi – following his sankalpam (will). svarUpa sthithi pravruththi – We have already seen that svarUpa is basic nature or characteristic; sthithi is that from which it draws its sustenance and pravruththi is its activity. SrI rAmAnuja now explains these three features for prakruthi, purusha and kAla thathvam (true states). prakruthi is primordial insentient state (achith thathvam). purusha refers to all jIvAthmAs and kAlam refers to time. We must see the svarUpam, sthithi and pravruthi for each of these three states. prakruthi is composed of sathva (goodness), rajas (passion or desire) and thamas (ignorance). It is unlimited in its dimensions, is wondrous (it will keep changing constantly – it will exist one day and disappear the next day, it will show something as true one time and as false another time). prakruthi’s svarUpam is being insentient (achith), made up of sathva, rajas and thamas (see above for meanings of these terms). prakruthi’s sthithi is being the tool for jIvAthmAs’ enjoyment in materialistic realm or his liberation from materialistic realm (samsAram) to reach spiritual realm (mOksham or SrIvaikuNtam). In other words, prakruthi provides jIvAthmA with space with which he can enjoy through the five sensory perceptions all that he wants to and keep on taking birth and death repeatedly or use the space for contemplating on bhagavAn all the time,surrender to him and attain spiritual realm. prakrithi’s pravruththi is to provide places such as dhivya dhEsams or holy rivers or such like for jIvAthmAs to worship or have holy bath or meditate on bhagavAn. It also provides all the implements for jIvAthmAs to carry out their activities. jIvAthmA’s svarUpam is to be different from achith (insentient). achith keeps changing while jIvAthmA doesn’t. achith has no gyAnam (knowledge) while jIvAthmA has. However, jIvAthmA is constantly associated with achith. jIvAthmA’s sthithi is food and water. jIvAthmA needs a physical body for its existence and body needs food and water. If there is no body, the jIvAthmA can not sustain itself. jIvAthmA’s pravruththi is to engage in activities which will result in pApa (result of sinful activities) or puNya (result of good activities). kAlam’s sthithi is being the driver for chith and achith to change themselves. It will indicate when jIvAthmA will leave the body or when a flower will fall from the plant and dry up. svaSEshathaika svabhAva – to be under the control of bhagavAn and be a servitor to him only and to no one else. 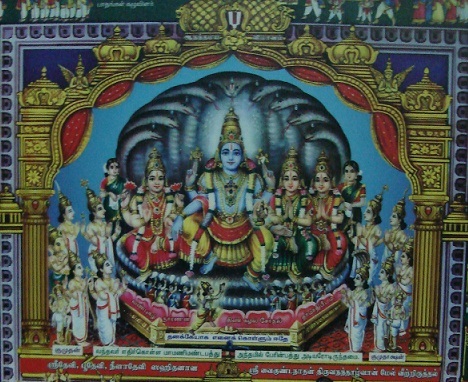 prakruthi purusha kAlAthmaka – as seen above, being in the states of prakruthi, jIvAthmA and kAlam, each with its own svarUpam, sthithi and parvruththi. nikhila jagadh udhaya vibhava laya leela – be the creator, protector and destroyer of all the worlds, without leaving anything; doing these as a pastime or play thing. With this SrI rAmAnuja has completed explaining the meaning of nArAyaNa term. To recap, he surrenders to pirAtti in the first chUrNai. In the next chUrNai, he prays for nithya kainkaryam (everlasting kainkaryam) along with parabhakthi, paragyAna and parama bhakthi (to be in an exalted state when with bhagavAn and to be in highly depressed state when separated from him, to see him in person and to be alive only when with him respectively). Through the 3rd and 4th chUrNais, pirAtti grants all his wishes. In the 5th chUrNai, he finds out who is that person to whom he should surrender. Just as vEdha says that one should meditate on the person who is the sole reason for the creation, protection and destruction of this world, he also looks at who possesses all the great qualities and comes to the conclusion that it is nArAyaNan only, as all beings referred to by the term the nArA: take shelter in him (ayana). He then goes on to explain who all form the nArA: groups and what are the svarUpam, rUpam and guNam of bhagavAn. In this we saw the qualities of bhagavAn, his thirumEni (physical form), his guNAs (divine qualities), his ornaments and his weapons. Then, SrI rAmAnuja speaks about his consorts who are constantly enjoying the qualities and physical form of bhagavAn in all his splendour. He then lists who are all in SrIvaikuNtam (the nithyasUris), what are the features in SrIvaikuNtam, what are the features of the world that he creates/protects/destroys (what we have seen in this part so far). What now remains is the act of surrendering. To facilitate the act of surrendering, he describes various qualities starting from “apAra kAruNya”. In between, he lists 8 qualities. Why should he state these qualities when he knows by now the supreme qualities and nature of the entity that he should surrender himself to? The reason for this is that these qualities supplement the qualities that he is going to state for being necessary to carry out the act of surrendering (starting with “apAra kAruNya“). Also, he has described several qualities of bhagavAn earlier (such as gAmbhIrya, oudArya, mArdhava etc). These qualities are further explained by the 8 qualities that he is now going to describe, starting with sathyakAma, sathya sankalpa etc. Also, in order to get full faith and deep belief in the being to whom we are going to surrender, we should be sure that he possesses all the qualities which would be enablers. These 8 qualities do that job, says SrI rAmAnuja. From the time that bhagavAn creates the leelA vibhUthi (materialistic world) to the time that the jIvAthma reaches his exalted feet to carry out kainkaryam (service) he controls everything that happens in between through the eight qualities. Let us see what these eight qualities are and how SrI rAmAnuja performed the SaraNAgathi (surrendering) in the next part of chUrNai 5. This entry was posted in gadhya thrayam, Other, SaraNAgathi gadhyam on December 18, 2015 by T N Krishnan.